Something is wrong with my sewing machine. At least, I think so anyway. 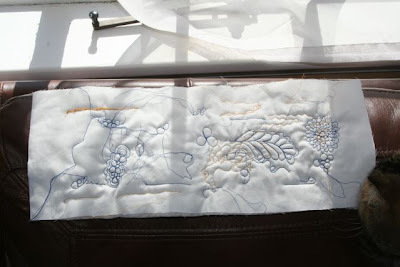 At times, free motion quilting has been very frustrating. 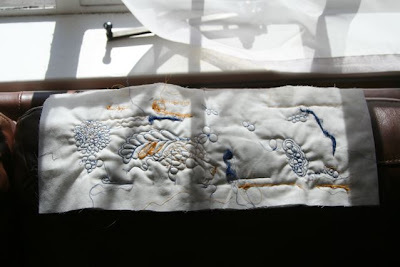 I've been quilting a bit on a spare piece to get the tension right. Things look okay from the front. The back is another story. There are huge loops in the bobbin thread. I've never seen this problem referenced in a book. I admit, I haven't read them all, but I really feel like it's the machine. Sometimes if I turn it off and come back later, the problem isn't there, but it's been happening more and more often. Straight stitching is fine. I just don't want to take my machine in to be serviced because I hate the idea of being without it, but I know I should because if it is a problem with the machine, it's not going to go away, and will probably only get worse. Second point of frustration, or perhaps a lesson for me. I finished one quilt pattern, and threw it on the couch to see how the ikea sheets hold up over heavy use. Most times, the quilt looks like this. That's all the backing fabric, rather than the pretty quilt side. For a couch quilt in my house, people definitely see the back. I should just make it reversible. 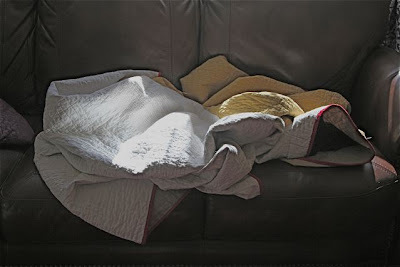 Recently, my boss told me that her mother was at one time an avid quilter, but was now looking to declutter her space. She had a lot of old quilting supplies, and my boss asked if I wanted some. Hmmm, let me think about it. Free quilting stuff? Yes of course! Bring it on! 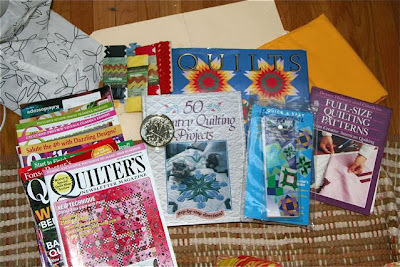 I did get some things that will be very useful for me, like a tin of pins, and a really gorgeous book of quilts through history. I also got some things that I might not have spent money on, but am glad to have, like some paper free motion quilting patterns, old quilting magazines, and some ric-rac to try out. Most of the fabric was not to my taste, so I only took a bit of cheddar colored fabric. I also picked up several bags of polyester batting in various sizes. I've never used it before, and haven't particularly wanted to, but batting is the most expensive item in my quilts right now, so I appreciate the opportunity to cut down costs while I develop patterns. I went to Joann's yesterday to take advantage of the 50% off thread (which I actually needed), and when I was done I decided to check out Fabric Depot, which several people swear by. It was interesting. They certainly have a lot of fabric! I wasn't thrilled with anything I saw there, but they did have a big selection of solids, batting, and thread which is good to know. Their prices seemed consistent with Joann's. There was so much quilting fabric there, but I wasn't tempted. In some ways, I enjoy working with the cotton sheets from Ikea, because I don't have to worry about color at all. All the colors I could pick from (navy, red, white, off-white, gray, royal purple, gold, and sea green) go together. It takes a lot of pressure off me. I just don't think I quite have the eye that some people do for color. A few weekends ago, my friend Leslie invited me to a sewing group meeting at her work. It was the first time I'd ever gotten together to sew with others, so it was an interesting experience. It was at a preschool, so I set up my machine on a tiny table, and sat in a tiny chair. I did get a bit of work done though! This quilt (which is the BOM quilt) is supposed to be finished by April, so I have a bit of work to do. 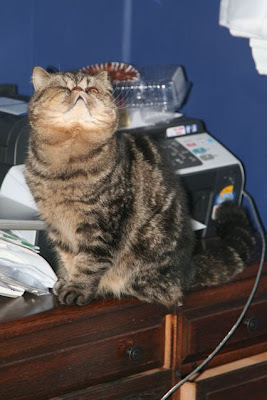 This photo is my attempt at pebbles. Circles were a bit more challenging then I anticipated, but I think I got the hang of it by the end. I liked the way the bigger pebbles puffed up. 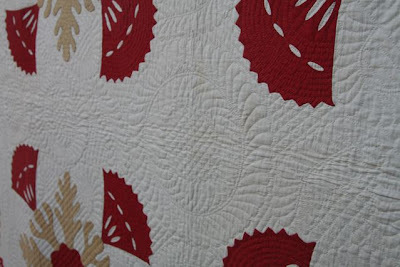 My friend Leslie told me that she really liked the quilting pattern that looked like coral, which I couldn't visualize. She drew it out for me, and it turns out she was talking about an allover meander. This was a hard design for me, but I suppose with practice it would be easier. I kept trying to make sharp curves. 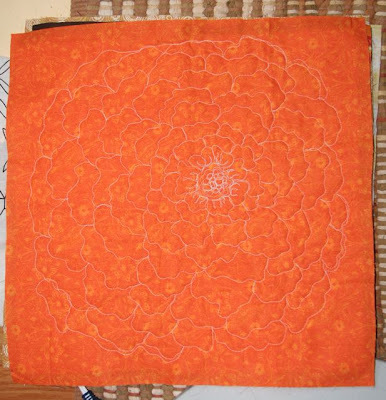 I got this design from the freemotion quilting blog, and I love the flower look. It shows up better on the back. I signed up to do the next year's BOM, mainly because I like to have an excuse to go to the fabric store once a month and talk to other quilters. I also really like the design of next year's quilt. 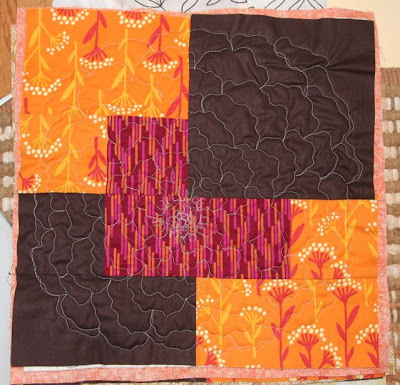 I probably won't do the quilt as you go method again, because I don't like having to stop at the edges of each block. I'd rather quilt the whole thing in one go. The Modern Quilt Guild has asked people to define what modern quilting means to them, and I've been turning it over in my head for the past few days. Finding a good way to start to describe it has been difficult. I'm not a trend forecaster, and I can't really say what styles or colors will emerge as definitive of this era of quilting. Any attempts by me to name them run the risk of seeming silly ten years from now, when all my guesses were wrong. 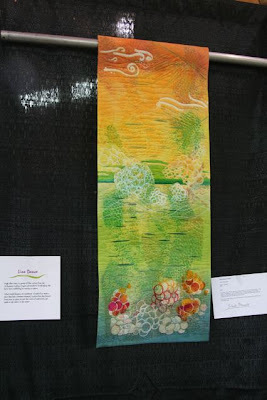 I do feel safe in identifying some factors that to me, make quilting, or any sort of art form modern. 1. Materials and manufacturing: The materials and manufacturing of any given art movement or era greatly influence the work that is made. How fabric is made and printed, and what it's made from will have a big impact on the look of modern quilting. 2. 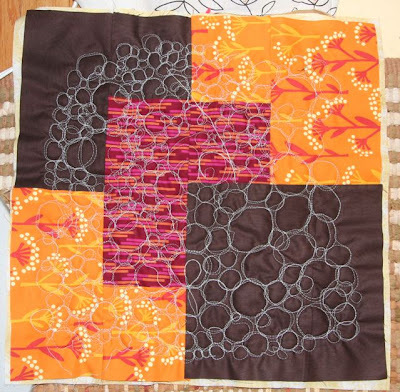 Technology: Thanks to the internet, quilting is globally accessible. Fabric can be bought and delivered anywhere. There aren't any limits to what/how much you can get. 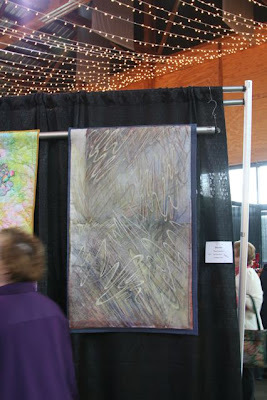 Feedback on quilts and ideas in quilting are instantaneous. 3. 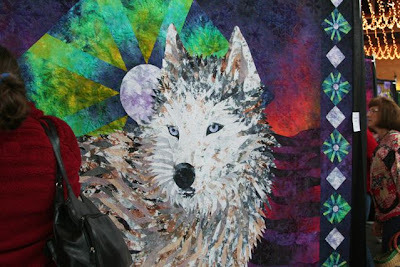 Trends in Society: What's happening in fashion, art, and politics will put a mark on quilts. 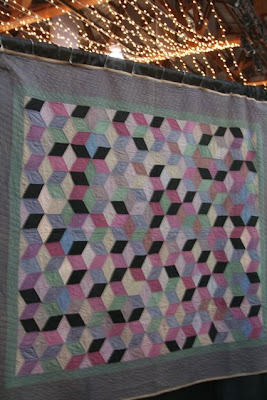 Color trends bleed into quilting. 4. The people who make the work: Not everyone is a quilter. Not even everyone who would want to be, is. 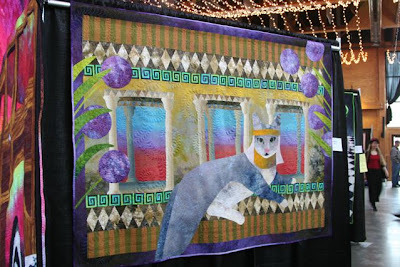 Quilting takes time, money, and space, and not everyone has that. 5. 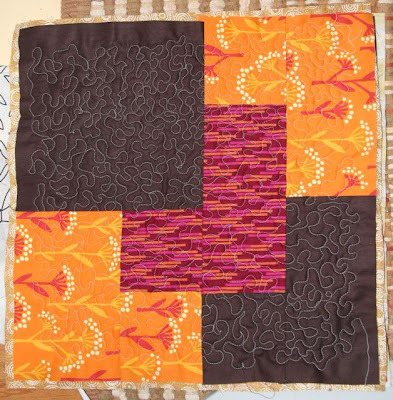 The final purpose/intent of the work: The original purpose of making quilts has changed. Quilts are no longer necessary. Fabric goods are cheap and plentiful. Bedspreads can be bought anywhere, and mass produced quilts are available to buy. 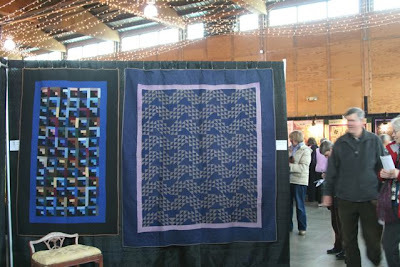 Quilts are now a hobby, which removes limitations of quilts as bedspreads. 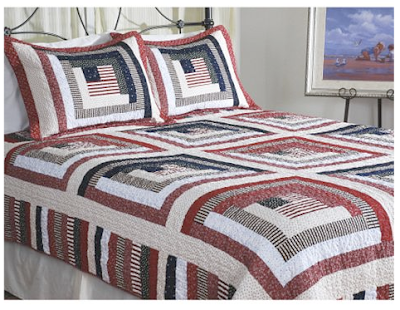 You can pick up this bedspread set below at Wal-Mart for under 50 dollars, which, depending on where you buy your fabric, less than the cost of buying fabric for a twin size quilt. I really believe that a clear vision of whatever this modern quilting era is all about will only emerge after it's been established. As we are now in the middle of it, it's still a time of experimentation with colors and patterns, as well as sizes and purpose. Oh hello. 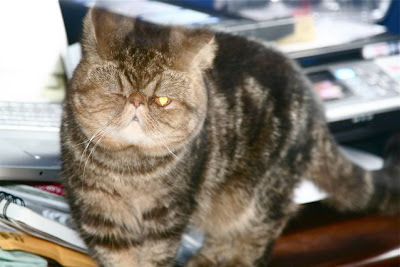 I didn't see you come in. 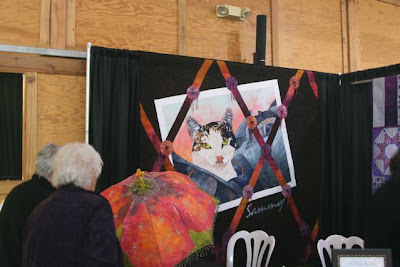 This past Saturday I went to a quilt show at the Oregon Garden down in Silverton. My friend Elyse lives there, so I had a nice brunch with her and her family before heading over to the show. The space was very pretty, with lots of twinkly lights on the ceiling. This group of quilts was from a local fiber arts group, and they all incorporated a lime green line somehow. 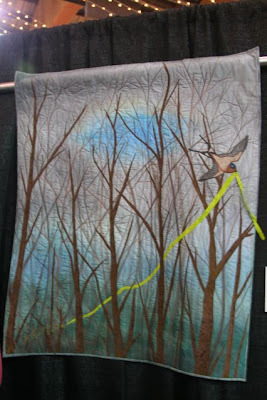 I liked the way the green line was slightly separate from the rest of the quilt. 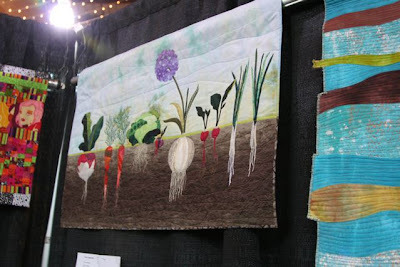 I thought the root vegetables were a natural subject for thread work. The brown fabric isn't quilted, it's just a perfect print for the subject matter. 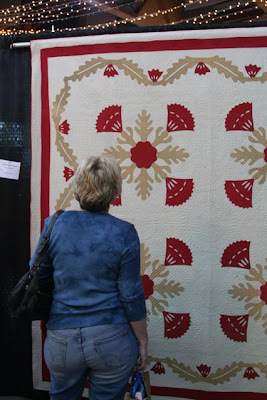 There were also some antique quilts there, which I have a real fondness for. They look timeless. Check out the nice hand stitching! I love the blue and tan one on the right. I thought this one was interesting. I couldn't quite tell where the quilting was though. It was very light and transparent. There were a whole series like this. I can appreciate the craftsmanship (which was amazing) even if the imagery isn't exactly my taste. I'd seen pictures of these online somewhere before and assumed it was applique, but it is all patchwork. Very impressive. Check out the cool quilted umbrella!